Enjoy your choice of fishing at a thriving reef system or out in the deep ocean! 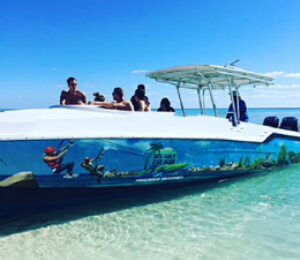 Get there fast on our 40 foot powerboat! The seas that surround the Bahamas are teeming with fish that promise for a fun time, regardless of the time of year. Set sail with your skilled and knowledgeable captain as you’re navigated to the best fishing spots to ensure you have the best experience. Try your hand at reef fishing and see what you’ll pull up. Will you catch snapper, grunts, triggerfish, grouper? Come find out what a variety of fish are waiting for your bait on a reef fishing charter! If reef fishing isn’t what you’re wanting, try fishing at greater depths with our deep sea fishing option. Let your captain support you in this thrilling experience as you hook into a boss mahi from unseen depths. Catch your very own tuna, mahi mahi or maybe a wahoo. Be sure to bring a cooler along so you can take your prize back with you. These charters will go out on our 40’ boat with triple 300hp Mercury outboards so you won’t be wasting time putting along the shore eating up the precious fishing time. I have been to the Bahamas many times, but Reef or Deep Sea Fishing Charter is one of my favorite trips! It includes everything that everyone should do here. As a Bahamas veteran, I can say only the best about this experience!